A DIY guide to mixing and laying on plaster. 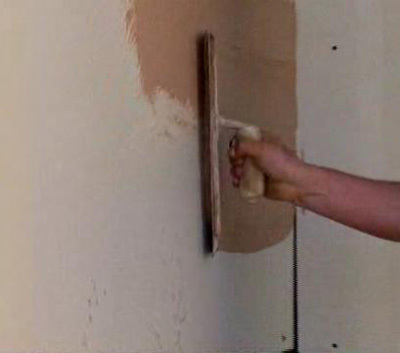 How to skim plaster and plastering a base or undercoat before skimming or top coat plastering. We explain the different types of plaster you can buy, including Base Plaster, Browning Plaster, Hardwall Plaster, Bonding Plaster and Skim Plaster. How and where to use these different types of plaster and the plastering tools you need. If you are planning on constructing a Stud or Dryline wall, you may find our Partition Walls and Plasterboard Project useful. Once you’ve constructed your Stud or Dryline wall it then needs to be plastered. Plastering is a difficult skill to learn and is nearly impossible to teach from a book. The basics can be described but getting the wall level, flat and smooth is done by “feel”, rather than technique. The technique is important of course, and we will outline that here, but this is another of those jobs where practice is invaluable. Do not expect to walk away from a perfect job the first time you attempt plastering. 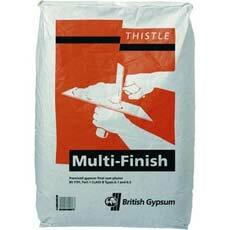 The plasters below are all Thistle plasters and made by British Gypsum. They are the plasters a plasterer will use and if it’s good enough for the pros, it’s good enough for the DIY enthusiast. There is nothing particularly wrong with stores “own brand” plasters but Thistle plasters are no more expensive, and are generally regarded as the best. Bonding Plaster: Bonding is an undercoat plaster. This means it is the first coat, or undercoat to be applied to a new (or to be patched) wall. When it is trowelled off, it is scratched with a nail to give a “key” for the top coat, or finish plaster to adhere to. 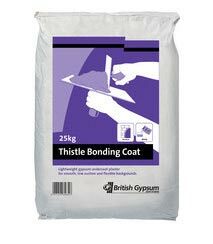 Bonding plaster has incredible “stickabilty” and does not rely on an absorbent surface to bond to. Browning Plaster: Browning plaster is also an undercoat plaster for use on more absorbent surfaces. 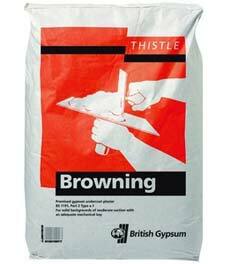 Browning plaster works much better on surfaces with a mechanical key and you will often see bricklayers “raking out” the joints of block and brick walls which are to have a Browning plaster covering. Hardwall Plaster: Hardwall is similar to Browning except that it offers a higher impact resistance and quicker drying surface. It is the most often used undercoat plaster these days, and can be applied to most masonry surfaces. Tough Coat Plaster: Even tougher than Hardwall as an undercoat plaster, and has a greater coverage based on the nominal depth of 11mm. 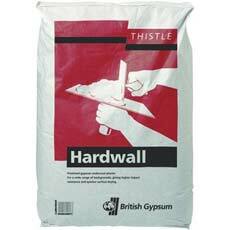 Again, suitable for most masonry walls. 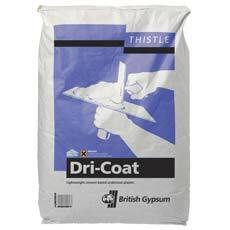 Dri-Coat Plaster: Dri-coat plaster is a cement-based plaster used when resurfacing a wall after installation of a new DPC. Multi-Finish Plaster: Thistle multifinish is a top coat plaster which is suitable for a great finish on all the other surfaces. Multifinish is ideal for (indeed, is manufactured for) using as a finishing plaster when there are a variety of backing surfaces to be covered. 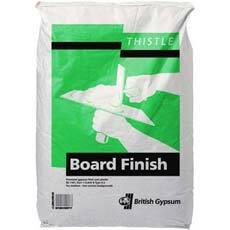 Board Finish: Board finish plaster is used on surfaces with low – medium suction. Plasterboard and Dry-Coat plaster will accept Board Finish well. One Coat Plaster: Sometimes called patching plaster, this plaster is a mix of something like binding plaster and multifinish. 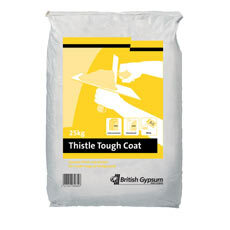 It is designed to fill patches in one go and can be “laid on” to far greater thicknesses than normal undercoat plasters. Anything up to 50mm some manufacturers claim. We would not advocate laying on at any more than 25mm. Once on the wall this plaster can be trowelled up to a very smooth finish and no further application is required. No matter how hard we have tried over the years we cannot get as good a finish with One Coat as we can with two coat plaster work. But that’s our problem – You have a try! Mixing plaster the first time is a trial and error job. Plasterers use different consistencies of plaster for different jobs and being a plasterer’s laborer is the hardest job in the world…. Bar none! The important thing to remember is to add the plaster to the water, not the water to the plaster. Mixing base coat plaster is considerably easier than top coat or finish plaster. To mix base coat, you need a large container. Old timers use a shovel in a tin bath. 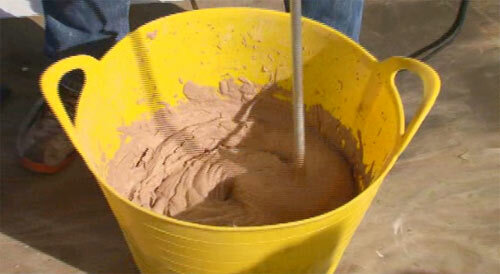 Nowadays it is not uncommon to see basecoat being mixed in a cement mixer. The plaster should be mixed well and there should be no lumps in it at all! The consistency is up to you and we advise experimenting by mixing separate piles to see how you like it. It is worth the additional cost of a bag of plaster to get the job right. Imagine the kind of mud that is so soft your wellies simply slide through it as you walk, but when you pick your feet up there is tonnes of it stuck to your boots…. That’s the kind of consistency you are looking for! Getting finish plaster right is important. The average mix of finish plaster will be on a medium suction surface for approximately 10 minutes before it starts to go hard. When it starts to go hard, it goes very quickly. When it is hard, and bumpy, there is absolutely nothing you can do with it except chop it off or plaster right over it. It’s obviously important to get it right and this can only be achieved with practice. A “wasted” sheet of plasterboard and a bag of finish plaster, or multi finish may cost £15.00 but you will thank the heavens you chose to practice. 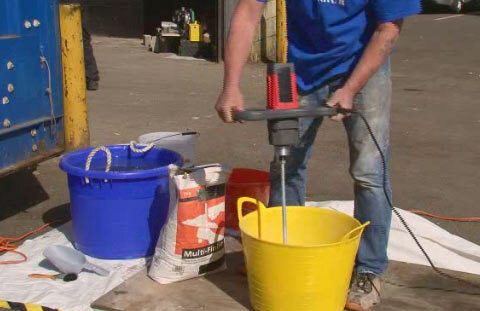 Finish plaster is mixed in a bucket (a 2 gallon builders bucket is ideal for novices) with (ideally) a variable speed electric drill and a “paddle”. Paddles can be bought at all DIY stores or hired from your local hire shop. 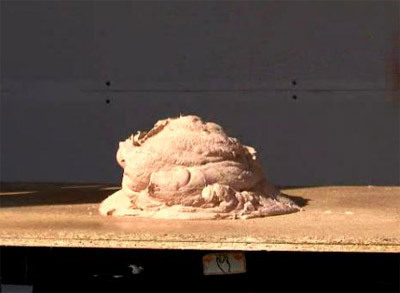 Clean cold water should be put in the bucket first to about one third of the depth then finishing plaster tipped in gently, until the heap rises above the surface of the water. 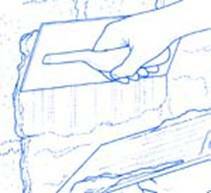 The paddle, on a low speed, should then be placed in the bucket and moved up and down, and side to side, to mix the plaster. You may have to add more plaster to get a consistency to that of thick porridge. Always have another bucket of water close, to you so that you can clean off your tools immediately. This includes the paddle. If you mix a new batch of plaster and there is still some of the old remaining on any of the tools, it will go hard much quicker. The mixing bucket should be cleaned thoroughly. 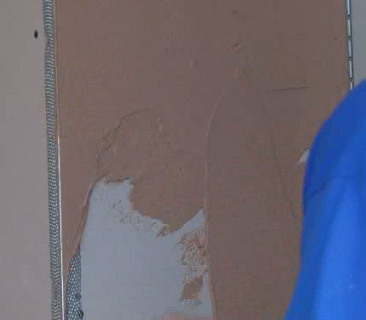 For novice plasterers the same technique can be used to divide the wall into manageable sections to plaster. Builder’s merchants can supply you with 10mm plaster stop beads which you simply fix to the wall. The beads can be fixed by placing a few small dabs of plaster on the wall and pushing the bead into it. After a few minutes the plaster will grip the bead. If you have any external corners to negotiate, external angle beads can be fixed in position to make these easier for you. Stop beads can also be bought at 3mm thick for application and division of the finish coat. Ideally both coats of plaster should measure 3mm thick and if the wall is the correct, consistent thickness it will dry out uniformly, with no cracks. The same principle, once again, as demonstrated in our foundations project. Before you start to apply plaster, damp the wall down with a large emulsion brush and water. Don’t let the water run down the wall, just enough to make it damp. The application of undercoat plaster to the wall is called laying on. The mixed plaster should be placed on your hawk, about 2 trowels full at a time. It is then “scooped” from the hawk to the steel trowel (sometimes called a steel float) onto the wall. Spread it about so it is slightly proud of the beads on the wall. Take a straight edge (metal is better than timber) and lay it over the two beads at the bottom of the section you have filled. Push the straight edge against the beads and pull upwards, sliding side-to-side as you go. Do not worry if some chunks come out as you drag upwards. Scrape the plaster off the straight edge back into the bucket and go back to your hawk and trowel, fill the holes and any areas that may be a little low. There should be some surface fissures, but not too many and none too deep. Repeat the process a couple of times until the section is full, flat and relatively smooth. Now move to the next section. The metal beads are galvanised (so they don’t rust) and will stay in the wall. There is no need to remove them. When you have done two or three sections the plaster should be beginning to go hard. When you can put your finger lightly on the surface without leaving a mark, its time to “rub in”. This means getting the plastic float and rubbing in a circular motion over the wall to close any fissures still remaining. You will feel the surface go smooth under your touch and after a while you should be able to sense any depressions or high spots in the wall. You can add, or remove, a little plaster to put these right. When you have finished you will have a smooth looking wall…. Seems a shame we are going to scratch it to bits in a moment! 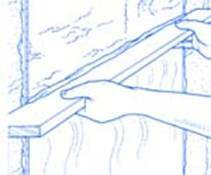 Any narrow areas such as the gap between a door frame and an adjoining wall can be filled with one of the “small tools” shown above. There is a great variety of small tools to get into various nooks and crannies around the house, and all are available from good tool stores. If you have fixed angle beads to any external corners, the undercoat plaster should finish just below the tip of the angle. This will allow you to use the same bead to plaster your top coat to. After a couple of hours the undercoat plaster will be hard enough to scratch. There are special metal “combs” for this, but these are only really necessary when you are trying to cover over about 40 square m in one go. The average novice should aim for a maximum of 4 square metres in one go. 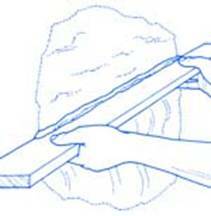 Take a nail, or a small screwdriver, and drag it lightly, in a coil shape, over the surface of the plaster. The scratch should be no more than 1mm deep and all of the wall should be covered with no more than 150mm between any of the scratches. Rub over the wall lightly once more with your plastic float just to flatten out the burrs caused by the scratching. Time to apply the top coat, or skim, once the top coat beads are in place. If 3 or more hours have passed between undercoat and top coat, it’s a good idea to damp the wall down again. This will give you a little longer to work with your top coat. Firstly, you will need to mix up a batch of top coat. Again, this has to be to a certain consistancy, that of thick porridge and when layed on a flat surface should be self-supporting. This is much more of a “feel” process and you should position yourself so you can see the thickness of plaster you are applying. Ideally you will apply the plaster in 2 layers. A very quick “flash” coat of 1mm, then a more deliberate coat of 2mm. Lay it on as you did the undercoat. Try to get the plaster to an approximate even thickness, but do not spend time trying to get it perfectly flat at this stage. This is impossible. Cover the area as quickly as you can. Go back to the starting point and trowel over again getting the plaster a little flatter and smoother. Then again, and probably again. Every time you re-visit, the plaster will have gone a little harder. It is the timing that is really important in top coat plastering or “skimming” as it is known. Each pass on the hardening plaster should see more and more trowel marks and bumps disappearing. When the plaster is almost fully hard, your final pass will trowel it to a lovely flat finish. To assist with the last couple of passes it is perfectly acceptable to “flick” water on the wall using the emulsion brush you used to damp the wall down. This will assist in getting rid of trowel marks. Don’t worry if the wall still has one or two marks on it, when it’s dry, it can be sanded down lightly. Exactly the same method is used to fill patches of wall which need plastering only, instead of using metal beads as a guide to depth, you use the side of the hole you are patching. Simply run your straight edge over the wall.